Last summer I got a great new laptop that unfortunately had a lousy keyboard, so I began a search for an external full size keyboard that I could carry with me in my laptop bag. As most of the keyboards made today are the lighter, soft-touch model, I really wanted a classic mechanical keyboard from the 90s. My search took me to the 6GV2 keyboard by SteelSeries. 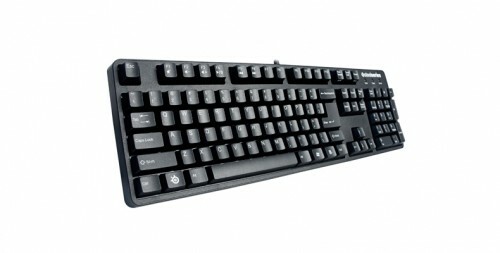 A mechanical keyboard is one where the key is depressed on a spring and contact is made sending the signal to the computer. In a soft-touch keyboard, the key rests on a rubbery membrane which can wear out over time. 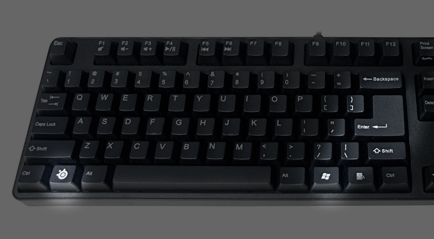 A mechanical keyboard gives you a better tactile sensation when typing as well as a very satisfying click-click-click. It takes a little more pressure to press the keys, but any of you who have been computing for more than the last few years will welcome the familiarity a mechanical keyboard provides. The 6GV2 connects to your computer via USB but includes a PS/2 connector if your computer still has that port. It’s a shame that these connectors are no longer standard, because it can receive more data and thus more keystrokes than a USB + software driver combination. That said, for normal use, USB is just fine. The keyboard is built of solid black plastic and weighs in at a little over a pound. The extra weight is quite welcome as it prevents the keyboard from drifting across your desk as you type. It’s a full keyboard with a standard layout (for the most part) with the QWERTY main area (together not split), separate bank of arrow keys, cluster of Insert/Home/Delete/End/PgUp/PgDn, number pad, and function keys across the top. There is not much of a border around the keys, so those used to an area above the function keys for “cheat sheets” may be disappointed. However the compact size enables the unit to be more portable. Though primarily built as a gaming keyboard (where multiple simultaneous key presses are the norm), the 6GV2 is nearly perfectly suited as a standard keyboard replacement. Unfortunately, the gaming origins of the keyboard have led to some design decisions which keep this SteelSeries unit from perfection. For example, instead of being able to adjust the tilt of the keyboard to one or two heights above level as most other keyboards allow, the 6GV2 is molded to a fixed angle with no adjustments at all. The result is an almost flat keyboard with the backend only about three-fourths of an inch higher than the front. Not a major problem and it could be overcome with some other lift, but it would have been nice to have built in adjustable feet. Another oversight is that while the keyboard is designed “for gamers”, SteelSeries forgot that there are a number of left-handed gamers out there as well – myself included. Apparently right-handed gamers have an issue where they hit the standard Windows key (normally to the left of the spacebar) while playing a game which can cause the computer to return to the Windows desktop. To solve this, they removed the Windows key from the left and put it on the right side of the spacebar. Those of us who use this key regularly for non-gaming purposes will find this relocation annoying an unnecessary. SteelSeries replaced this key with their own function key (with the company logo) for accessing the volume and media playback controls. A better solution would have been a hardware switch on the back or underside of the keyboard to allow the user to switch the Windows key off or to swap the usage of the Windows and SteelSeries keys. Again, not insurmountable, but if you alternate between this and a normal keyboard (at work perhaps) then it could be a pain point. Finally, and this could be the result of European design (SteelSeries is headquartered in Denmark), the keyboard has the (annoying) large L-shaped ENTER key. I recall this key tried to rear its ugly head in the late 90s, but did not catch on, but for some reason it’s back again. It’s billed as a positive as it’s easier to hit and admittedly is one of the more common keys used. The extra space taken up by this key displaces the “pipe (|) & backslash (\)” key and moves it to a smaller key next to the right SHIFT. For programmers, the pipe and backslash are pretty common keys and this change has resulted in numerous frustrating and accidental presses of the ENTER key. These minor problems aside, however, the SteelSeries 6GV2 is an outstanding keyboard with quality and performance that far exceeds the normal off-the-shelf soft-touch style of keyboard. The satisfactory feedback from each key press as well as the rugged and durable construction of the unit make it a highly recommended addition to your desktop or laptop system. The 6GV2 retails for $99.99 and is also available at Amazon.com. This entry was posted in Reviews and tagged 6gv2, keyboard, steelseries. Bookmark the permalink. Are the key legends (characters, numbers, symbols) engraved or embossed, or are they painted on and therefore subject to wearing off as mine do because of finger nails? @Joe — Good question. They are embossed and then painted white. I assume the paint could wear off, but you’d be left with the raised plastic.